AgroAtlas - Relatives - Trifolium arvense L. - Hare.s-foot Clover. Trifolium arvense L. - Hare.s-foot Clover. Family Fabaceae Lindl., genus Trifolium L.
Trifolium agrestinum Boreau, Trifolium arenivagum Boreau, Trifolium arvense (Celak.) A.Kern. subsp. gracile (Thuill. ), Trifolium arvense L. var. gracile (Thuill.) 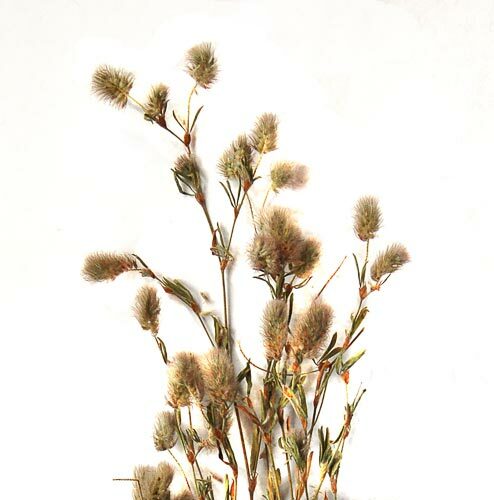 DC., Trifolium brachyodon (Celak.) A.Kern., Trifolium brittingeri Opiz, Trifolium capitulatum Pau, Trifolium eriocephalum Ledeb., Trifolium gracile Thuill., Trifolium longisetum Boiss. & Balansa. Annual pubescent herbaceous plant. Stems 20-40 cm tall, erect, branched. Three leaflets 15-20 mm long, 2-4 mm wide, oblanceolate-oblong, unequally dentate at apex. Flowers about 3 mm long, pinkish, aggregated in cylindrical heads. Calyx 5-6 mm long, villous with dense pubescence of long brownish hairs, with elongate-subulate teeth 2-3 times as long as tube. Tube 10-veined. Pods coriaceous, 1-seeded. Flowers in May . June, fruits in July . August. Autogamous plant. 2n=14. European part of the USSR, Caucasus, Crimea, northeastern Kazakhstan, southwestern Middle Asia, West Siberia, East Siberia (adventive), Far East (adventive). In dry meadows, forest glades and fringes, steppe slopes, field fringes, roadsides, mainly on sandy and sand loamy soils. May be used as forage plant. Grossheim AA. 1952. Flora of Caucasus. 2nd ed. V.5. P.194-221. (In Russian). Minjaev NA., ed. 1981. Manual of Higher Plants of the Northwestern European Part of RSFSR. Leningrad. 376 p.
Bobrov EG. 1987. Clover - Trifolium L. In: Fedorov AA., Tzvelev NN., eds. Flora of the European part of the USSR. V.6. P.195-208. (In Russian). Bobrov EG. 1945. Clover - Trifolium L. In: Shishkin BK., ed. Flora URSS. V.11. P.189-261. (In Russian). Pavlov NV., ed. 1961. Flora of Kazakhstan. V.2. Alma-Ata. 515 p. (In Russian). Polozhij AV., Malyshev LI., ed. 1994. Flora of Siberia. Fabaceae (Leguminosae). V. 9. (In Russian). Hulten E., Fries M. 1986. Atlas of North European vascular plants north of the Tropic of Cancer. V.1-3. Konigstein: Koeltz Scientific Books.